Yes, this blog is not vegetarian nor vegan but it's fair to have vegetarian/vegan recipes every once in a while. بعرف إنو هاي المدونة مش نباتية بس لازم أشاركم وصفات نباتية كل فترة وتانية. 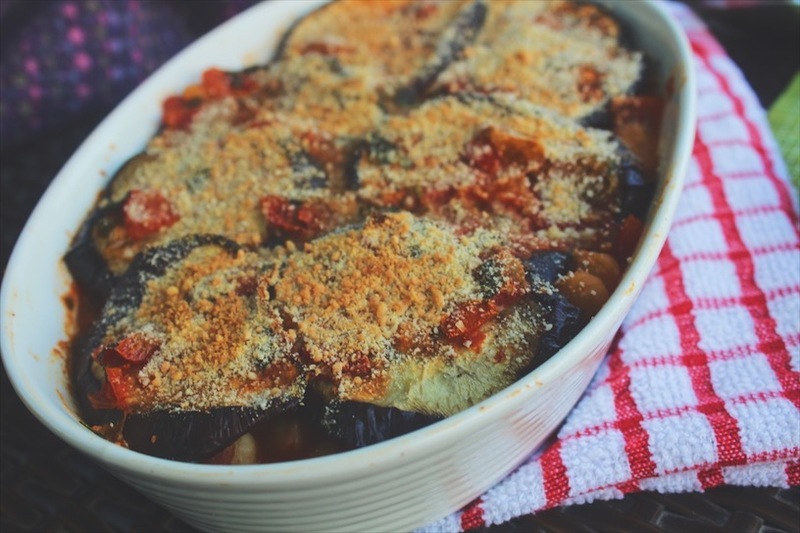 This delicious moussaka is a hearty dinner for vegans as well as anyone who's taking a break from all the meaty dishes. هاي المسقعة ممكن تكون وجبة عشا/غدا مثالية للنباتيين أو أي حدا حابب يريح شوي من اللحوم. Moussaka is a traditional Palestinian/Arabic dish prepared by layering eggplants and a thick tomatoes filling usually prepared with ground beef. 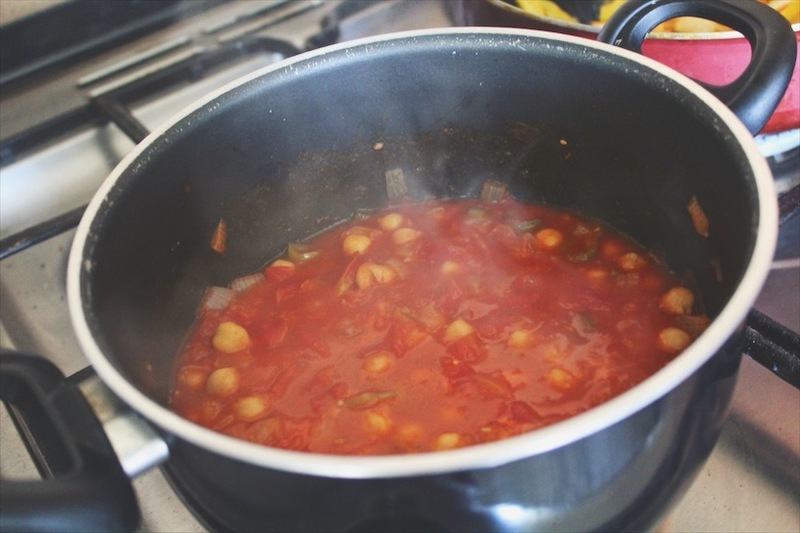 Yet, for this vegan dish, we'll substitute it with the beautiful, hearty chickpeas! المسقعة من الأكلات الفلسطينية/العربية إلي بتتحضر من طبقات بتنجان وحشوة بندورة بالعادة بتتحضر مع لحمة مفرومة. بس لهادا الطبق النباتي، رح نبدل اللحمة بالحمص الحب اللذيذ. Moussaka has many variation in different cuisines including the greek which uses a Béchamel sauce layer, turkish, and Balkanian that uses potatoes instead of eggplants. المسقعة ممكن تتحضر بطرق مختلفة في مطابخ مختلفة زي باليونان إلي بستخدمو فيها طبقة من صلصة البشاميل، تركيا، البلقان وإلي بستخدمو البطاطا بدل البتنجان. To keep it healthy, the eggplants will be baked instead of fried. لنخليها صحية، البتنجان حنشوي بدل ما نقلي. Chili peppers for a some heat. فلفل أخضر لشوية حرقة. Final touch: parsley. اللمسة الأخيرة: بقدونس. Some breadcrumbs for a crunch. شوية بقسماط للقرمشة. It can be served with brown rice, whole wheat toast, or shrak bread (my way). ممكن يتقدم مع الأرز البني، خبز القمح، أو خبز الشراك (زي ما أنا بحبو). Pickled olives are perfect with this dish. الزيتون ممتاز مع هادا الصحن. 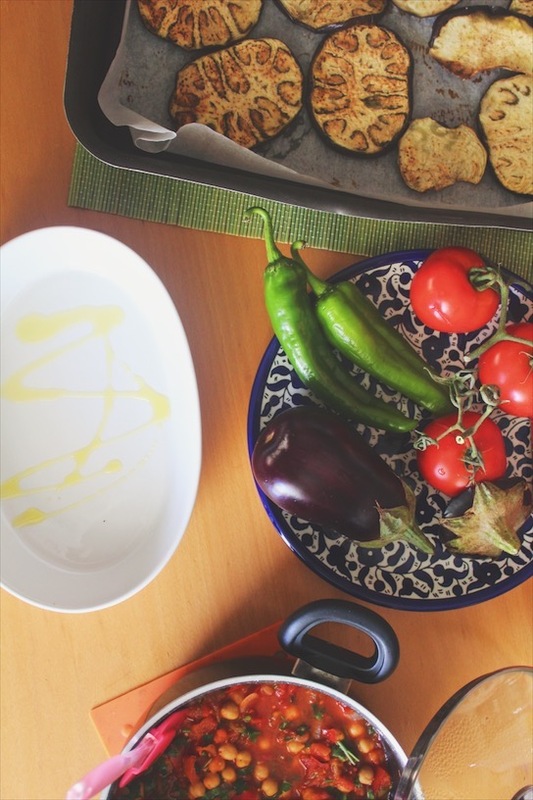 Moussaka, with its name meaning chilled in arabic, is usually served as a cold dish but can still be enjoyed warm. المسقعة، وإلي إسمها معناه إنا باردة، بتتقدم بالعادة كطبق بارد بس ممكن كمان تتاكل ساخنة. 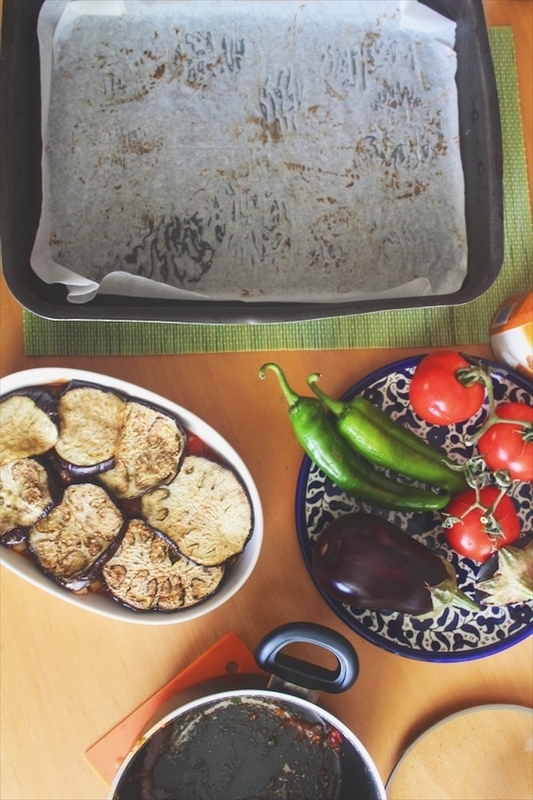 Place eggplant circles on a baking sheet lined with parchment paper, season with salt and ground pepper, and drizzle with olive oil. Bake in an oven at 400F for 30-45 minutes, making sure its tender. Flip eggplant circles after 15 minutes. Add olive oil to a hot small pot, then add chopped onions and chili peppers and sautee until tender. 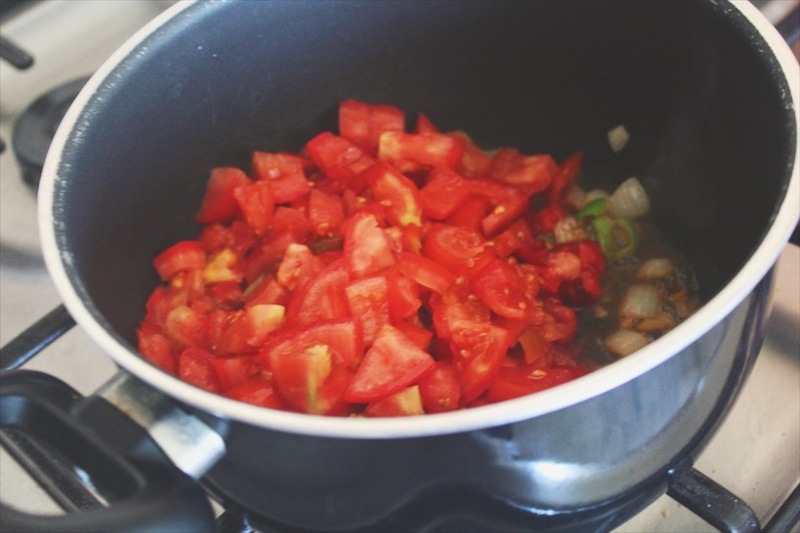 Add chopped tomatoes and cook until tender and simmer for 10 minutes. Season with salt, ground pepper, and smoked paprika. Add chickpeas and leave to cook for 5 more minutes. Finally turn off the heat and add chopped parsley. In case the filling is not in right consistency, add 1 tbsp tomatoes paste and 1/4 cup of boiled water and leave to cook before adding the parsley. 3. 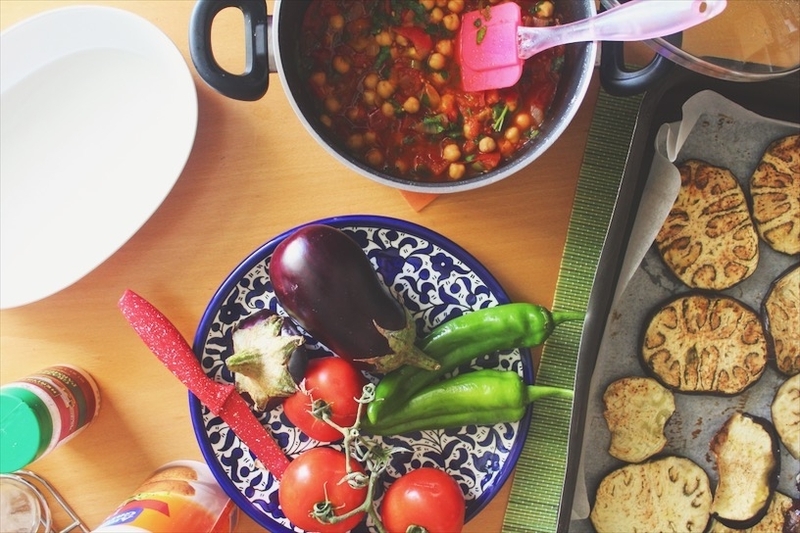 Drizzle some olive oil at the bottom of the casserole and start layering: eggplants, tomato chickpea filling, eggplants. Finish with a layer of breadcrumbs (Parmesan cheese can be added as well). 4. 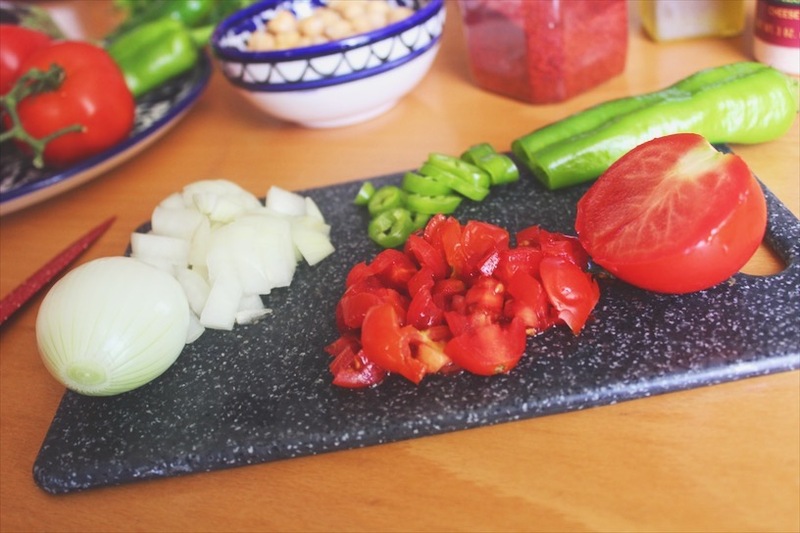 Broil in the oven for 5 minutes and serve hot or chilled with brown rice, whole wheat bread, or shrak bread and some fresh vegetables. ١- بنوزع شرائح البتنجان على صينية خبز عليها ورق الزبدة، بنبهره بالملح والفلفل الأسود، ورشة زيت الزيتون. ٢- بنشوي بالفرن على درجة حرارة ٢٠٠ لمدة ٣٠-٤٥ دقيقة، لحد ما يستوي. بنقلب البتنجان بعد ١٥ دقيقة من الشوي. ١- بنسخن زيت الزيتون في طنجرة صغيرة وبنضيف البصل والفلفل الحار وبنشوحهم ليستوي. ٢- بنضيف البندورة وبنتركها تنطبخ على نار هادية لمدة ١٠ دقائق. ٣- بنبهرها بالملح، الفلفل الأسود، والببريكا المدخنة. ٤- بنضيف الحمص حب وبنتركها تنطبخ كمان ٥ دقائق. ٥- بنطفي النار وبنضيف البقدونس المفروم. *في حال الحشوة ما كانت بالقوام والكمية المطلوبة، بنضيف ١ معلقة معجون الطماطم و١/٤ كوب ماء مغلي وبنتركها تنطبخ قبل ما نضيف البقدونس. ٣- بنرش زيت زيتون في الصينية الفخار وبنبلش الطبقات: بتنجان، حشوة البندورة والحمص حب، بتنجان. بنخلصها بطبقة بقسماط (وممكن نضيف جبنة البارميزان). ٤- بنشويها بالفرن ٥ دقائق وبنقدمها سخنة أو باردة مع أرز بني، خبز قمح، أو خبز شراك وخضراوات.